Ballymena United have yet to beat Warrenpoint Town at Milltown since the borderside's promotion to the Danske Bank Premiership. Picture: Press Eye. Ballymena United will attempt to break their ‘duck’ at Warrenpoint Town as they bid to extend their unbeaten run on Saturday. 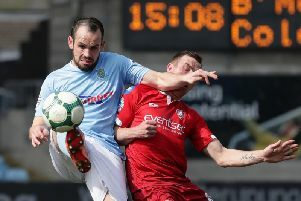 The Sky Blues have yet to win in three previous meetings to Milltown since the border side were promoted to the Danske Bank Premiership two season ago. United’s only victory in an away game against Barry Gray’s side came in November 2013 when Warrenpoint were ground-sharing at Stangmore Park while renovations were taking place to bring Milltown up to Premiership standard and United boss Glenn Ferguson is expecting another tough test. “It’s always particularly difficult down there because Warrenpoint are a good, sharp side. “Warrenpoint are coming off the back of a couple of bad results so they will be looking to put it right and they will make it very difficult for us. “We always want to try and pull away from these clubs in around us but the good thing is the majority of them drew or were beaten last weekend. Ferguson expects to have a number of senior players - including Scottish duo Gareth Rodger and Allan Jenkins - available after making a raft of changes of the midweek County Antrim Shield win over Glebe Rangers. “We knew we had to protect some of the players who were carrying niggly injuries going into Saturday’s game. “We had a number of players in midweek coming back from injuries and suspension so it was important to give some other squad members some playing time. “Some of them played 90 minutes and probably felt it as well but it will do them the world of good. “If and when they’re called upon for the next time, they know they have that game time under their belt and some of them didn’t do themselves any harm against Glebe. “Hopefully we will have players who will be fresh after a rest in midweek so we will mix the squad up again. “Hopefully if we can get back to the way we played against Glentoran and Cliftonville and work hard, I would be confident we can get a positive result at Warrenpoint but it’s certainly not a given,” added Ferguson. Matthew Ferguson (hip) was the only fresh injury concern from the midweek win, while fellow midfielder Nathan Hanley remains sidelined with a knee complaint. Seven Towers Supporters’ Club transport to Warrenpoint leaves Henry Street car park at 1.15pm. The club’s Joker promotion will be drawn prior to departure.